Watch hearts jump and play! A Lil' Fingers storybook. Pick the right chocolate and you could win a special edition Lil' Fingers Balsa wood flyer. Send a card that looks a lil' like you! Match all the candy hearts to win! Lots of coloring pages to print and color for the holiday! 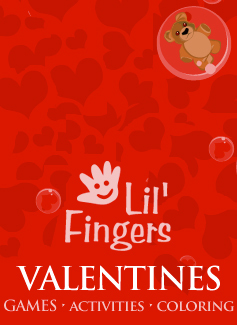 The best Valentines sites on the net. Each baby icon ( ) = 1 year to show a recommended age. games require faster computers and more memory.